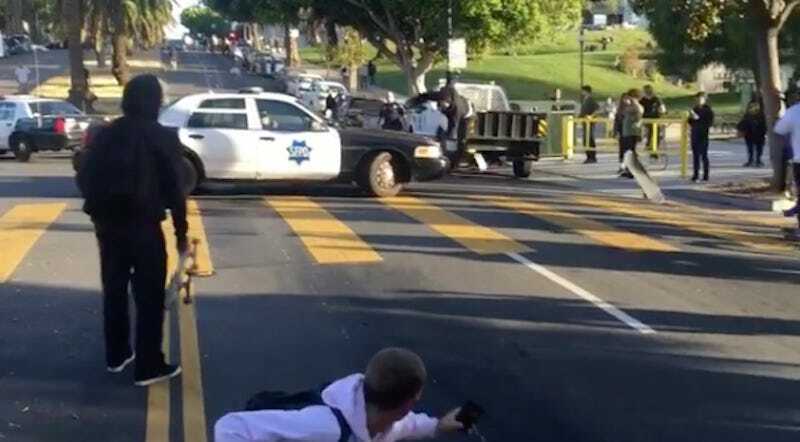 Skateboarders congregated at San Francisco’s Dolores Park in the Mission Tuesday to race down the street, but it wasn’t too long before police showed up. San Francisco PD parked a car at the bottom of the hill to try and deter skaters. One unfortunate soul skated right into the front of the vehicle after being blocked by a cop, who pulled a move reminiscent of Mike Tomlin’s. According to the San Francisco Chronicle, the skater was taken to a hospital. The Chronicle wrote that one officer was injured in the standoff, although no arrests were reported. The police ceded ground around 9 p.m. local time after they felt everything was under control.